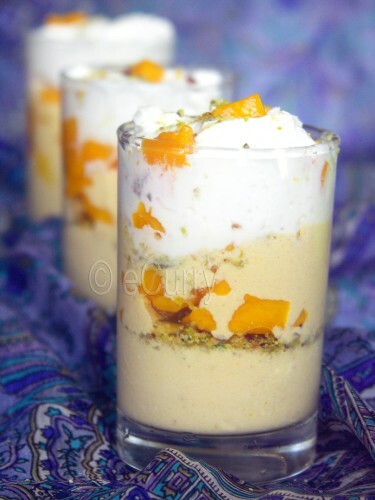 or Mango Fool (Fool is a cold dessert made with pureed fruits or berries served with whipped cream), or A Mango Parfait, call it whatever you wish to call; irrespective of the names, this is one heavenly dessert. I do not think there is another fruit which I adore & crave more than Mango. Summer comes, & I get transported to the childhood memories of summer & buckets of mangoes in the mango orchard that my uncle had. We did not know of any other dessert that dominated our table most during summer; it would be fresh cut juicy ripe mangoes. The entire house would be filled with the sweet smell of mangoes. The hot & lazy afternoons when all of us would sit down with bowls & whole mangoes which we would peel by ourselves while the yellow juice dripped down our elbow… everything worth licking off:-) are the among the cherished memories. I miss indulging in mangoes here. No orchards, no abundance, but only a few boxes through the short lived summer, but we do try to make the best use of it. I still like my mangoes fresh & ripe the best, but why not some desserts too? 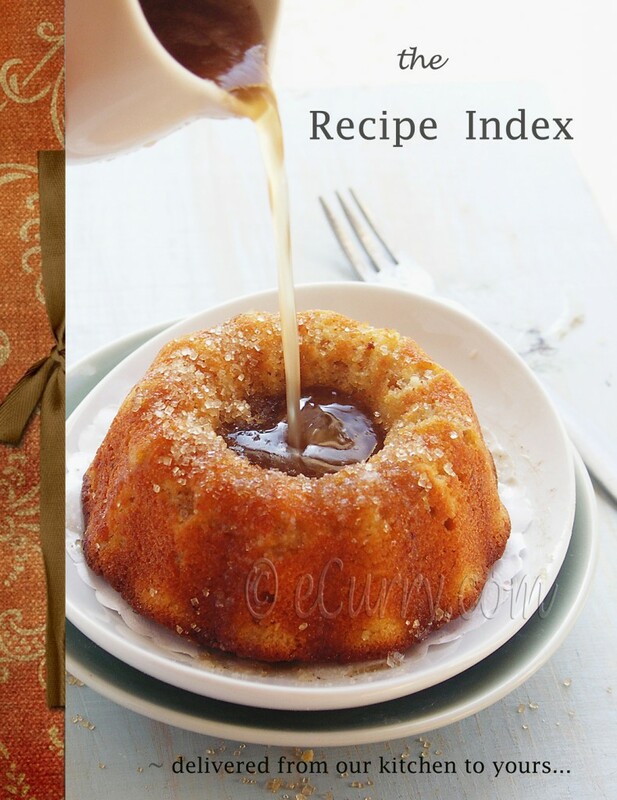 If you are looking for quick soul filling dessert for the summer – this is the one…. Peel the mangoes with a serrated knife, & slice off the fruit not going too close to the stone. Puree the mango slices & sieve & strain out the fiber from the pulp. Beat the cream (& the saffron if you are using it) just until it forms very soft peaks. (Whisk the sugar with the cream if you are using sugar). Save some of the cream for topping. Gently fold in mango pulp gently into rest of the cream. 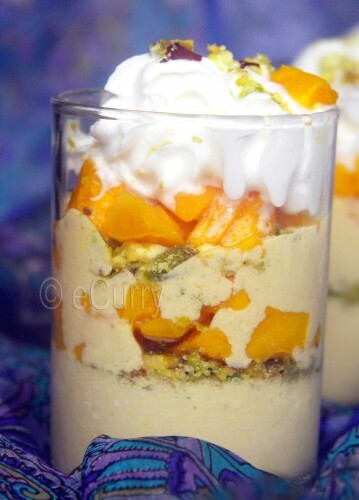 In a serving glass, spoon some of the Mango Cream. 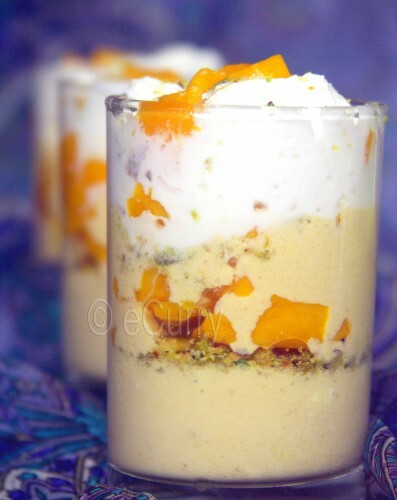 Sprinkle some pistachios on the cream; top it with some fresh mango pieces; Spoon some more Mango Cream on the fresh cut mangoes… & repeat as many layers as you would want. Top of finally with some whipped cream! Sprinkle some pistachios & add some small fresh cut mangoes. 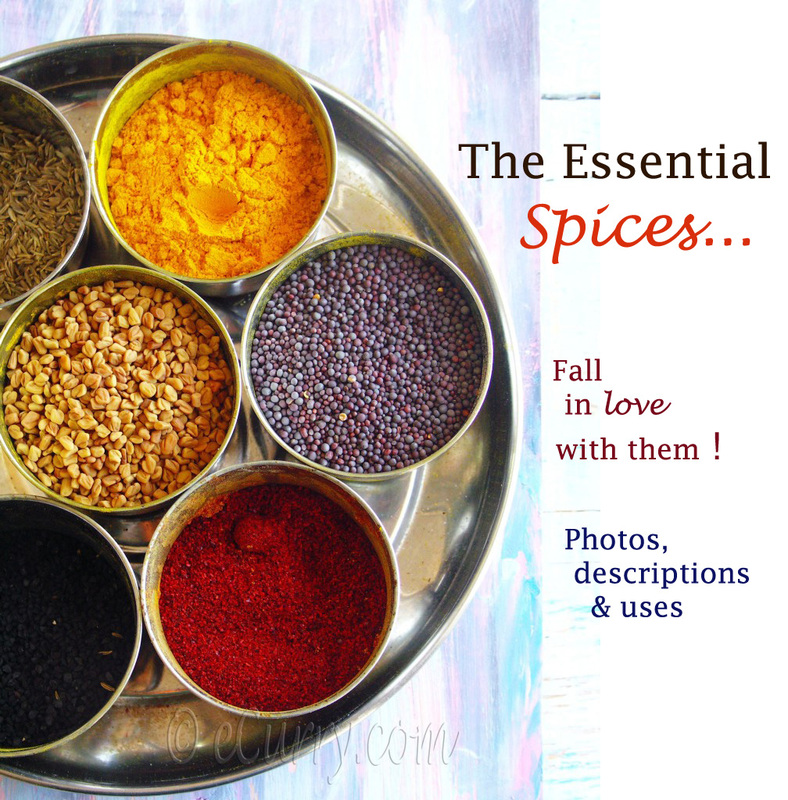 If there is one perfect summer delight, this has to be it…. 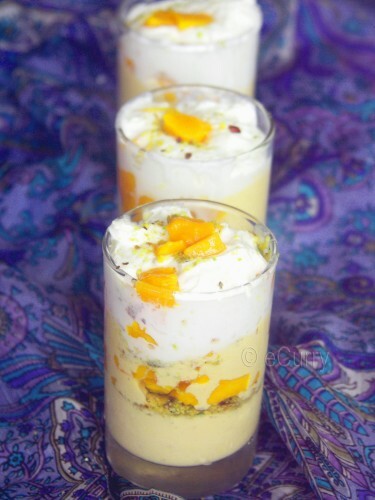 A cold tall glass of chilled cream & mango; close your eyes, & relish your every spoon-fool. This is a one great recipe if you have company. The Cream & the fruits may be prepared few hours ahead, & them assembled together in a jiffy when needed. 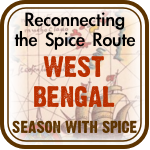 Sending this to Srivalli’s Mango Mela, hosted at Cooking 4 All Seasons. I too make something similar – don’t know what to call it. I don’t like the idea of a fool:). As long as it looks as delicious as this why bother? :) Lovely pics, Soma! Makes a great dessert. Amazing clicks! What an inviting dessert…so many delicious flavors all layered together. 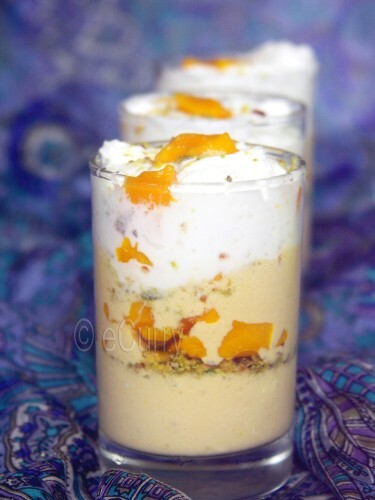 Mangoes & cream are a classic combination, & you’ve done these ‘beautifooly’!! Just lovely Soma. I made mango fool with my daughter last year, & we loved it!! This takes me back to childhood too. What a classic delicious combination. I can eat mangoes and anything edible made from these, though i just don’t like sweets.But i always give in to the temptation of eating something as deli sh as this, if it has some mango. Thats a lovely dessert! i bet thats gonna taste yum..
Just excellent! I love mangoes. Great presentation as usual and very nice pictures. Those look so good! What a great way to enjoy mangoes! oh my god!! this sounds heavenly… can i dig in? Delicious.I know it is delicious Soma.I too love the fool and had made it. Such a lovely dessert and with mangoes in it I could eat this every single day. I have never made mango cream before. Yummy. You should make the cream Supriya, it is just heaven. Perfect for summertime, looks heavenly soma! i’d love to digg in!! See this make me wish I picked up another mango at the farmer’s market! Mangolicious treat for summer:) great pics and this seems easy to put together too! I love anything with mangoes…This is mouth watering..
Yum! I would love this mango parfait right nown – beautiful! So pretty – I was craving mango the other day and bought some mango popsicles, this looks even better! This is fantastic !!! looks lovely ! Cant wait to try this out. 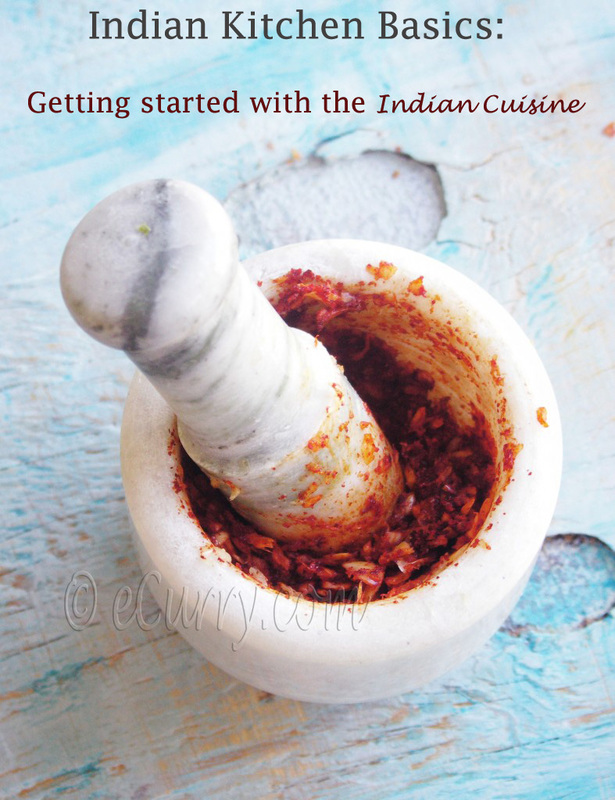 I love mangoes too and this recipe looks amazing! This is another fantastic way to have mangoes. Frankly, I ve never been able to understand the name “fool”. There’s nothing in the least foolish about this dessert! Perfect for Summer! Wonderful presentation and it looks so delicious! This looks so great with the layer of pistachios! How great that must have been to have so many mangoes. This dessert is a great use of some of them. 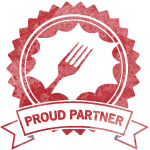 Regardless of what it’s called, it’s making me hungry! Thank you for sharing. I can see where this can be adapted to use other fruits and nut variations. Love the idea of calling it “FOOL”… looks soo yummy!